The head tax makes another appearance—will it stick this time? Council members Mike O'Brien and Kirsten Harris-Talley announce their proposal for a tax on businesses to invest in housing and homelessness on October 12, 2017. After growing demands from community organizers, city council members Mike O'Brien and newly appointed Kirsten Harris-Talley are proposing an employee hours tax (also known as a head tax) on businesses that would invest another $24 million in housing and homelessness. The 2018 budget proposal sent from Mayor Tim Burgess, which was mostly completed during Ed Murray's time, set aside $63 million for homelessness—a number many community organizers, social workers, and some council members thought wasn't enough. "Without this investment, I'm afraid that our current budget sets us up for failure," O'Brien said. 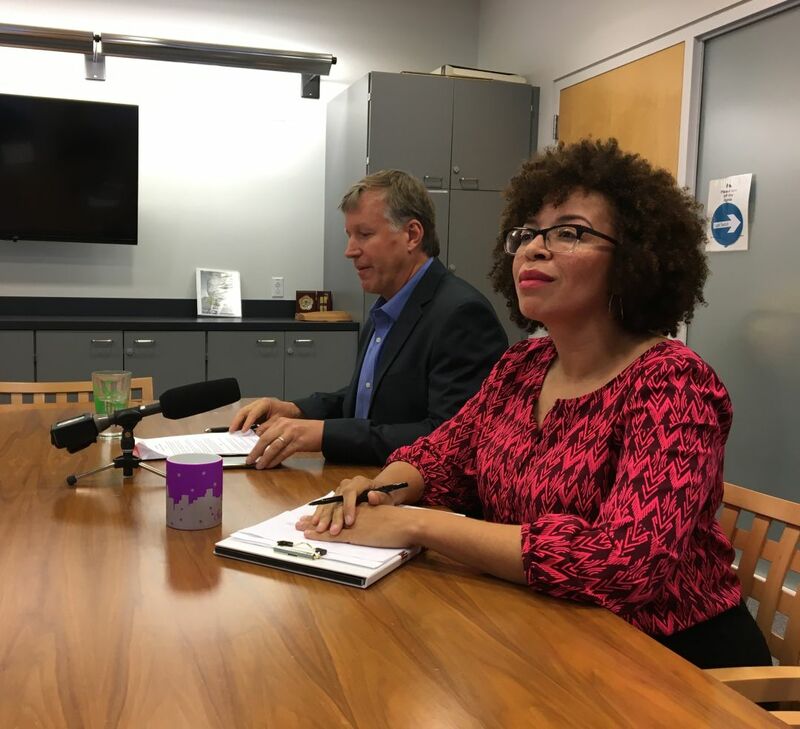 O'Brien and Harris-Talley at a press conference Thursday announced their proposal—they're calling it Housing, Outreach, and Mass-Entry Shelter (HOMES)—that would add more than one-third of its current funding. But the Seattle Chamber of Commerce CEO said the city wasn't spending its allocated funding wisely, and that a "new tax on jobs" was not the answer. The employee hours tax proposal would affect businesses that have gross revenues above $5 million a year—an estimated top 10 percent of companies in Seattle—with a 4.8 cent per hour, per employee tax. That's about $100 a year for a full-time employee, which would create another estimated $24 million a year in revenues to invest in shelters, permanent housing, and rental assistance vouchers for low-income residents. "This does not fix every factor of houselessness in the city but one of the major crisis points that we have," Harris-Talley said, adding that they want to protect small businesses owned by minorities and people of color who are most affected by displacement. "We think this is an invitation for (the most affluent) to help address what success has looked like and who's been on the other side of that, and help us solve the problem." The tax for big businesses has been an idea floated around in the past by council members, including former council member Nick Licata and Kshama Sawant, but it's never been successful. The Housing for All Coalition included a big business tax in its list of demands to council members earlier this month—with growing grassroots organizing, O'Brien said he thinks it could happen this year. When asked about Burgess's response to the proposal, O'Brien said "the mayor historically has not been a fan of the employee hours tax, but he's also aware that there's a crisis that needs to be addressed." If the tax gets three council members on board, Burgess would then need to sign off on the final budget by the end of November. Burgess declined to comment at this time. Maud Daudon, the Chamber's CEO and president, said "allowing people to live in RVs" and camps was not a longterm solution, and that the city should be using its funding more effectively. “We can do better. However, Councilmember O’Brien continues to propose tactics that look backward—RV lots have proven to be a failed strategy to get people into permanent, stable housing," Daudon said in a statement. “We need to invest our resources wisely toward solutions that work, instead of pursuing a new tax on jobs." When asked whether they were concerned about a chilling effect on corporations, the council members said big businesses will continue to be part of the city regardless of whether there's a tax. They said businesses should contribute to systemic changes in the city that are affecting its residents experiencing homelessness. "This has always been a place of opportunity and places that businesses can come and grow," Harris-Talley said. "Quite frankly the city gives folks a lot of incentive to be here. There's no reason they shouldn't have an opportunity to give back to the folks who are impacted by those changes." O'Brien said the city's Rapid Rehousing program would fail without the additional investment. He said he wants $20 million annually invested into housing and homelessness beyond 2018. From the employee tax, about $5 million would be invested into shelters—including 24-hour shelters like encampments or tiny homes, according to the city—and most of the remainder into housing and vouchers. The council members also want $1 million put into expanding the Law Enforcement Assisted Diversion program into the North Precinct. Updated 9:40am on October 13, 2017, to include comments from the Chamber of Commerce.